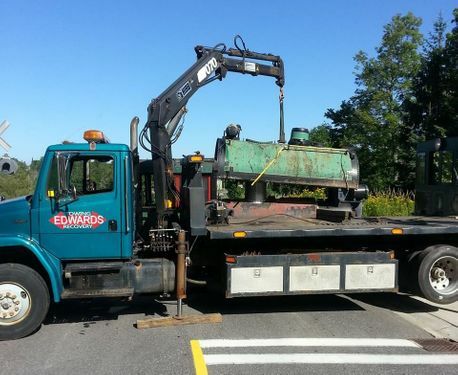 Edwards Towing and Recovery began service in the early 1970's with one truck and one owner/operator. Now over 40 years later, we have over 10 vehicles and 2 generations of Edwards' to look after ALL of your towing and recovery needs. We specialize in everything from the smallest vehicles up to some of the heaviest trucks that run our roads today. You can rest easier knowing that we are all Wreck Master Certified, and therefore are trained professionals that truly know what we are doing when you need help. In keeping with the ever-changing vehicles these days, we have upgraded all of our vehicles to ensure you that your vehicle is in good hands. We are always striving to be one step ahead, that is why we make sure our trucks always have the newest technology to help us serve our customers better. We take pride in this being one of the only family-run towing companies in the area. With our fast and efficient service you will agree that we are the best.